Although a comparatively small book for the fantasy genre, Brown packs a surprising amount into this tale of politics, families and intrigue. 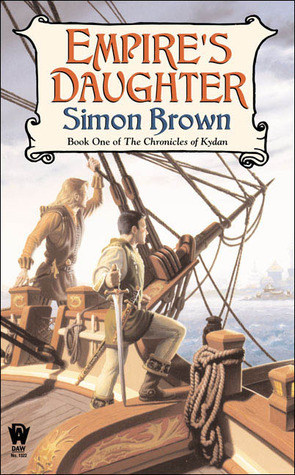 Set in a wonderfully detailed world that revolves around two expansionist empires and their brutal intrigues, Brown flexes his pen and proceeds to present to the reader ideas that are intriguingly different to the flood of medieval fantasy currently in the market. Not that medieval fantasy is bad, mind you, but great ideas in this genre seem to be few and far between these days.In the world of the Kydan Chronicles, political power has been held exclusively by the Kevleren family for over 240 years. Distinct in appearance, the Kevlerens also stand apart from the people they rule by virtue of their gift - the ability to Wield the Sefid, a magical power that is untouchable to most people. But to Wield the Sefid requires a sacrifice, and the greater the sacrifice, the more powerful the Wielding. The Kevleren horde their gift and Kevleren law restricts any marriage outside their family, nor may offspring from unions with non-gifted subjects be allowed to live.Opening with the crowning of Lerena as the new empress of the mighty Hamilayan Empire, the start of her reign is marked with conflict as General Third Prince Maddyn Kevleren defies his family and takes a commoner as a lover. In an effort to prevent disaster, Lerena offers him the posting of Commander on an expedition across the Deepening Sea to establish a colony in the politically troubled land of Kydan, thus moving him far enough away to effectively exile him, while also matching the expansive moves of the empire’s greatest enemy, the Rivald kingdom.Maddyn, Hamilaya’s most gifted military leader, accepts his cousin Lerena’s offer in an attempt to protect the life of his lover, Alway, and their unborn child from both the brutal law of the Kevlerens and from his last lover, the Duchess Yunara, sister to the empress. Beautiful, wilful and unstable, Yunara is the most gifted Wielder of the Sefid. Betrayed in love by Maddyn, she will stop at nothing to avenge her broken heart.As the dramas in her family play out, a revolt against the ruling Kevleren family in Rivald forces Lerena to confront a threat not just to that branch of the family, but Kevlerens everywhere. With twists and turns that keep you guessing, Brown has produced a gem of strong characters and vivid locales in a world bordering on a type of alternate industrial revolution. This is a tale that delights in the unexpected. This book was quite a surprise. Given the low price and average ratings, I was expecting a generic fantasy novel. Instead I got a compelling character driven story with some very interesting and unique takes on the typical fantasy tropes.It's not often a fantasy novel surprises me anymore, but this one genuinely did! Compelling characters with twists I didn't see coming.This book features an unusual form of magic, and I have to say I enjoyed it. Now I just have to hunt down the sequel. I didn't expect too much from this book, but I was pleasantly surprised. Simon Brown - Librarian Note: There is more than one author in the GoodReads database with this name. See this thread for more information. Simon Brown wrote his first science fiction story in 1966, read his first science fiction novel in 1968, and by 1970 had decided he wanted to be a science fiction writer more than anything else in the world.His first professional sale was to Omega in 1981. Since then he has had several short stories appear in Omega, Aurealis and Eidolon.His first novel, Privateer, was published by Harper Collins in April of 1996. His second novel, Winter, was published by Harper Collins in 1997. A collection of short stories, Cannibals of the Fine Light, was published by Ticonderoga Publications in 1998. A new novel, Inheritor, will be published by HarperCollins in late 2000.Simon worked as a journalist with the University of Western Sydney, and is now a full-time writer.